72173-RB is rated 3.9 out of 5 by 12. Rated 2 out of 5 by sharon from The pop-up keeps jamming. The pop-up keeps getting stuck in the down position. The first lasted about 3 years. Since then I have replaced 3 in approx 6 months. It looks nice when it's working, I just don't know when it's going to happen again. Rated 5 out of 5 by Cdwains from Clean and it just works. I love this drained paired with our new Cassidy wall mount faucets. It is just such a clean look and they both work great. Plus customer service is second to none. Rated 2 out of 5 by Lori Lynn from Did not solve my problem I purchased this pop up drain assembly kit on the advice of Delta in an attempt to solve a problem with a Delta faucet installation. In new construction, the lift rod on the faucet was nearly unusable because the faucet was installed too close to the granite backsplash. This product was to replace the current drain and eliminate the need to use the lift rod. The drain itself is well made but the round plug is much too large to look right in a sink. It might look fine for a bathtub installation. I can't understand why Delta would recommend this item for use in a sink. They need to make available a size that is better suited for lavatory sinks. Rated 3 out of 5 by Raychel from Inconsistent product I installed a Delta pop-up drain on a bathroom sink with no problems, so I purchased 2 more for my other 2 bathrooms with identical sinks. However, unlike the first the second leakes from both top nut holding the drain to the sink as well as the lower fitting down pipe. Also, when the domed cap in the sink is screwed tight the pop-up doesn't engage. If I loosen it a bit it engages, but doesn't release. To get if to work I have to unscrew it a complete turn and then it wobbles. I tried both new pop-ups and they are both the same. I even took the chrome cap and pop-up assembly from the good sink, but it didn't work in the second drain assembly. I can live with the loose cap and will now try plumbers tape to fix the leak. Rated 5 out of 5 by Jorge from Good product and very good price. Rated 5 out of 5 by Shar from Love them They matched our faucet perfectly. Had to make some ajustments to get them to fit our granite. but made them work. We liked them that much. Pewter is hard to find. Rated 5 out of 5 by Becky from Bold and beautiful Who writes a review about a drain stopper? Well this one is special order and sooo handsome. does the pop up drain twist off so you can remove hair? Does the 72173-RB work with a 1 1/2&quot; drain hole? If not, which one will? Is there a height adjustment for the pop up, it seems really high in the bowl when not pushed in the close position? can a bathroom pop-up drain be used with any delta bathroom faucet? I have the Delta Push Pop 72173, and my cleaning person pulled the pop up part out....how do I put it back in? if you use silicone under the flange, do you still use the rubber washer? Is Delta 72173 Push Pop-Up with Overflow compatible as a replacement for the drain pop-up that comes with Delta Addison Faucet Model 592-DST? 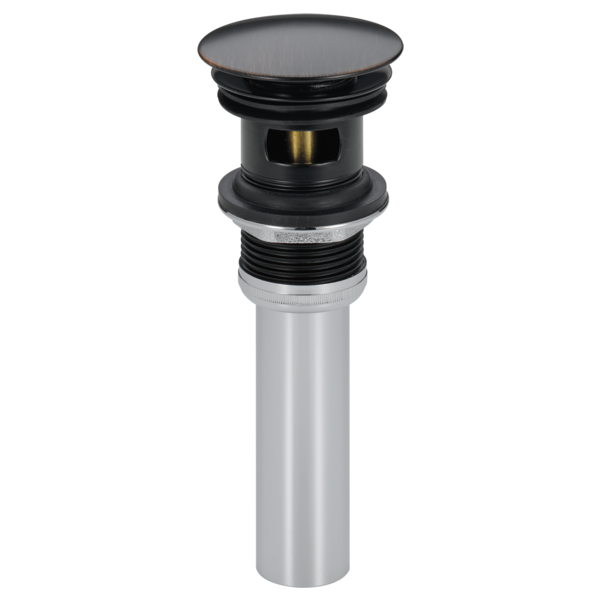 Is the Delta 72173 Push Pop-Up with Overflow compatible as a replacement for the drain pop-up that comes with Delta Addison Faucet Model 592-DST already installed in our sinks? The pop-up on our Addison Faucets do not function well and our plumber recommended replacing them with a Push Pop-Up.